fUCLA Stroke Center (D.S.L. ), University of California, Los Angeles, Los Angeles, California. BACKGROUND AND PURPOSE: The relationship between reperfusion and clinical outcome is time-dependent, and the effect of reperfusion on outcome can vary on the basis of the extent of collateral flow. We aimed to identify the impact of time-to-reperfusion on outcome relative to baseline angiographic collateral grade in patients successfully treated with endovascular revascularization for acute large-vessel anterior circulation stroke. MATERIALS AND METHODS: Two hundred seven patients were selected for analysis from our prospectively maintained registry. Inclusion criteria were M1 MCA ± ICA occlusions, onset-to-puncture time within 8 hours, and successful endovascular reperfusion. Baseline angiographic collateral grades were independently evaluated and dichotomized into poor (0–1) versus good (2–4). Multivariable analyses were performed to identify the effect of collateral-flow adequacy on favorable outcome on the basis of onset-to-reperfusion time and puncture-to-reperfusion time. RESULTS: In the poor collateral group, the odds of favorable outcome significantly dropped for patients with onset-to-reperfusion time of >300 minutes or puncture-to-reperfusion time of >60 minutes (onset-to-puncture time: ≤300, 59% versus >300, 32%; OR, 0.24; P = .011; puncture-to-reperfusion time: ≤60, 73% versus >60, 32%; OR, 0.21, P = .011), whereas the probability of favorable outcome in the good collateral group was not significantly influenced by onset-to-reperfusion time or puncture-to-reperfusion time. In the subgroup lesion-volume growth analysis by using DWI, the effect of puncture-to-reperfusion time of >60 minutes was significantly greater compared with the effect of puncture-to-reperfusion time of <60 minutes in the poor collateral group (β = 41.6 cm3, P = .001). CONCLUSIONS: Time-to-reperfusion including onset-to-reperfusion time and puncture-to-reperfusion time in patients with poor collaterals is an important limiting factor for favorable outcome in a time-dependent fashion. Future trials may benefit from a noninvasive imaging technique to detect poor collaterals along with a strategy for rapid reperfusion. However, the effect of reperfusion on outcome can vary on the basis of the extent of collateral flow.5⇓⇓⇓⇓⇓–11 Baseline collateral flow, which is an important determinant of clinical recovery, can mitigate potential injury to ischemic brain tissue.12 Before adequate reperfusion occurs, the penumbral area can continue to be salvageable depending on the robustness of collateral flow, and its impact on infarct growth and subsequent clinical outcome may be time-dependent, along with reperfusion status. It can be speculated that in patients with poor collaterals, the relationship between reperfusion and clinical outcome may be more dependent on time-to-reperfusion because the odds of potential brain injury may be higher until reperfusion occurs. We hypothesized that differential clinical response to reperfusion can be driven by the quality of baseline collaterals in a time-dependent manner. We sought to determine the relationship among time-to-reperfusion, angiographic collateral-flow grade, and clinical and imaging outcome, which may show that there is a narrow therapeutic time window for patients having poor collaterals, despite angiographic reperfusion. Between May 2006 and April 2013, patients were retrospectively selected from a prospectively maintained acute stroke intra-arterial treatment registry at our institution. 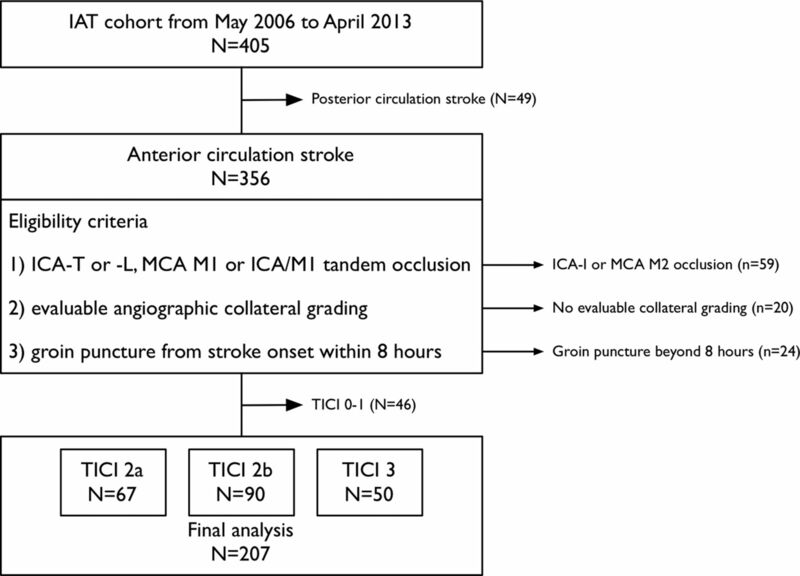 Eligibility for inclusion in this study was that patients met the following criteria: 1) They had an acute anterior circulation stroke with angiographically confirmed ICA-T or -L (-T or -L indicate the shape of occlusive lesion), MCA M1, or ICA/M1 tandem occlusion; 2) had evaluable angiographic imaging for collateral-flow grading; 3) had arterial puncture in the angiography suite room within 8 hours from time last-known well; and 4) achieved a sufficient angiographic reperfusion, which we defined as a TICI grades 2–3 (Fig 1).13 Within the 3-hour time window, intravenous rtPA was used,14,15 and patients showing a persistent ICA or MCA occlusion despite rtPA on TOF MRA or CTA were selected for endovascular treatment. We excluded patients who revealed well-developed parenchymal hypoattenuation on CT or hyperattenuation on FLAIR imaging, severe brain edema, intracerebral hemorrhage, or cardiopulmonary compromise. The local institutional review board approved this study for retrospective analysis. Flow chart description of patient selection and exclusion for the study. IAT indicates intra-arterial treatment. Statistical analysis was performed by using the SPSS statistical package (Version 20.0; IBM, Armonk, New York). Bivariate comparisons were made by using the χ2 test or Fisher exact test as appropriate for categoric variables. The Student t test was used for continuous variables, and the Mann-Whitney U test was used for ordinal and continuous variables that had skewed distributions. Multivariable regression analysis was performed to identify the effect of collateral-flow grade on each outcome or lesion volume based on prespecified various time cutoff points. The results are presented as OR estimates of relative risk with a 95% CI or β coefficient as appropriate. Probability values < .05 were statistically significant. During the study period, 207 patients were included for analysis, and the details of exclusion are described in Fig 1. Overall, 76 patients (37%) were assigned to the poor collateral group (collateral-flow grades, 0–1), and 131 patients (63%), to the good collateral group (collateral-flow grades, 2–4). The baseline characteristics and outcomes are described in the Table (On-line Table 1 in detail). Patients in the poor collateral group had a higher baseline NIHSS score, a lower baseline ASPECTSDWI, a higher incidence of ICA-T or -L occlusion, and a lower rate of 3-month favorable outcome, all statistically significant. As shown in Fig 2A, the probability of favorable outcome decreased with every minute increase of ORT in the poor collateral group (OR, 0.99; 95% CI, 0.99–1.00; P = .021). The effect of ORT on the probability of favorable outcome in the good collateral group was also time-dependent, but it was not statistically significant (OR, 1.00; 95% CI, 0.99–1.00; P = .080). With 30-minute time intervals, the OR magnitude was 0.80 (95% CI, 0.67–0.96; P = .015) in the poor collateral group compared with the good collateral group (OR, 0.90; 95% CI, 0.80–1.02; P = .096) after adjustment for age, baseline NIHSS score, and posttreatment TICI 2b–3 reperfusion. With a time cutoff point of 300 minutes for ORT, ORT of >300 minutes remained as an independent predictor of decreased odds for favorable outcome in patients with poor collateral flow (OR, 0.24; 95% CI, 0.08–0.72; P = .011) compared with good collateral flow (OR, 0.47; 95% CI, 0.21–1.08; P = .074) after adjustment for age, baseline NIHSS score, and posttreatment TICI 2b–3 reperfusion (Fig 3A). Unadjusted predicted probability of favorable outcome at 3 months by time-to-reperfusion based on collateral-flow grades 0–1 (red line) versus 2–4 (blue line). Solid lines represent the probability of favorable outcome over onset-to-reperfusion time (A) and puncture-to-reperfusion time (B) as predicted by an unadjusted logistic regression model based on collateral-flow grade. Dashed lines show the 95% confidence intervals. Outcomes of each observed case are also indicated on the basis of collateral-flow grades 0–1 (red diamond) versus 2–4 (blue square). A–D, The effect of time-to-reperfusion on clinical and imaging outcomes based on collateral-flow grade. a indicates logistic regression analysis adjusted for age, baseline NIHSS score, and posttreatment TICI 2b–3 reperfusion; b, logistic regression analysis adjusted for age, baseline NIHSS score, posttreatment TICI 2b–3 reperfusion, and onset-to-puncture time; c, linear regression analysis adjusted for age, baseline NIHSS score, posttreatment TICI 2b–3 reperfusion, and onset-to-puncture time. 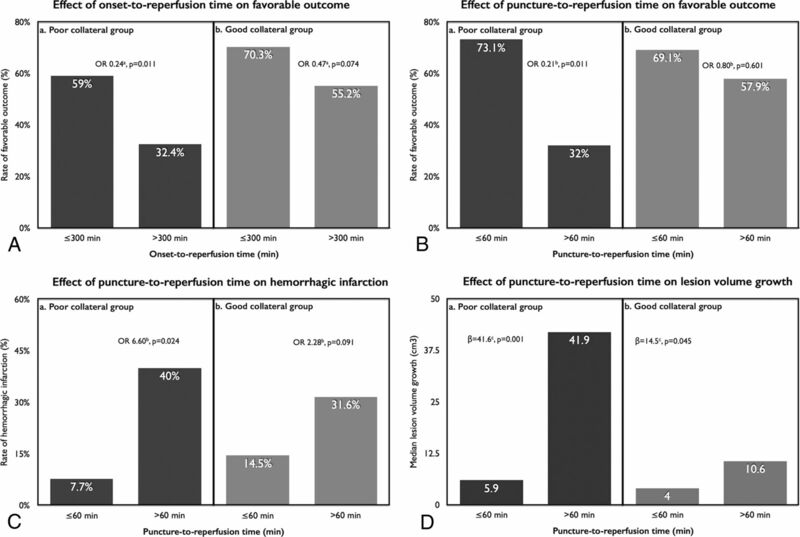 We divided the ORT between onset-to-puncture time (OPT) and puncture-to-reperfusion time (PRT) to determine the effects of time spent on endovascular treatment. There was no time-dependent effect on favorable outcome based on a time cutoff point of 240 minutes of OPT. Rather, as shown in Fig 2B, the probability of favorable outcome decreased with every minute increase of PRT in the poor collateral group (OR, 0.97; 95% CI, 0.96–0.99; P = .001). The effect of PRT on the probability of favorable outcome in the good collateral group was also time-dependent (OR, 0.99; 95% CI, 0.98–1.00; P = .005). According to a time cutoff point of 60 minutes, PRT of >60 minutes remained an independent predictor of decreased odds of favorable outcome in patients with poor collateral flow (OR, 0.21; 95% CI, 0.06–0.70; P = .011) compared with good collateral flow (OR, 0.80; 95% CI, 0.34–1.85; P = .601) after adjustment for age, baseline NIHSS score, posttreatment TICI 2b–3 reperfusion, and OPT (Fig 3B). The cutoff time points for ORT and PRT were chosen on the basis of sensitivity and specificity analyses, and details are described in the On-line Figure. Unlike the significant relationship between the probability of favorable outcome and time-to-reperfusion, no statistically significant relationship was seen between the probability of mortality and prespecified time metrics based on collateral-flow grade. As to hemorrhage, the rate of HI was significantly increased in patients with ORT of >300 minutes in both the poor and good collateral groups. Likewise, a PRT of >60 minutes also increased the rate of HI, which remained as an independent predictor of increased odds of HI (OR, 6.60; 95% CI, 1.23–34.1; P = .024) in the poor collateral group compared with the good collateral group (OR, 2.28; 95% CI, 0.88–5.95; P = .091) after adjustment for age, baseline NIHSS score, posttreatment TICI 2b–3 reperfusion, and OPT (Fig 3C). The rate of PH was not significantly influenced by the prespecified time metrics based on collateral-flow grade (On-line Table 2). A subset of 160 patients (of 207, 77.3%) completed both pretreatment and posttreatment DWI (3–7 days from stroke onset). There was a significant imbalance regarding the completion of both DWIs between patients with a favorable outcome or those without; 108 of 117 (92.3%) in patients with a favorable outcome versus 52 of 90 (57.8%) in patients with an unfavorable outcome (P = .000). At baseline, the median DWI lesion volume was 14.6 and 9.8 cm3 in the poor and good collateral group, respectively (P = .115). The median DWI lesion volume at posttreatment and DWI lesion-volume growth were 56.6 cm3 and 31.1 cm3 versus 18.4 cm3 and 7.0 cm3 in the poor and good collateral groups, respectively (P = .002 and .001). Multiple regression analysis was performed to elucidate the effect of prespecified time cutoff points on DWI lesion volume based on collateral-flow grade (On-line Table 3). PRT of >60 minutes in the poor collateral group was an independent predictor of larger final lesion volume (β = 46.8 cm3; P = .004) and lesion-volume growth (β = 41.6 cm3; P = .001) after adjustment for age, baseline NIHSS score, posttreatment TICI 2b–3 reperfusion, and OPT (Fig 3D). In addition, a PRT of >60 minutes was associated with lesion-volume growth (β = 14.5 cm3, P = .045) in the good collateral group, but the magnitude of the increment was not so large compared with the poor collateral group. The effect of final lesion volume and infarct volume growth remained significant from pretreatment DWI to reperfusion of >150 minutes in both groups; however, the magnitude of the increment was larger in the poor collateral group compared with the good collateral group. In patients with acute ischemic stroke attributable to large-vessel occlusion, selecting a candidate who will benefit most from endovascular revascularization therapy to optimize the practice of endovascular treatment is important for improving clinical outcome.24 In consideration of that point, defining the optimal timeframe for reperfusion based on collateral-flow adequacy is crucial in averting further ischemic injury.25,26 Our study demonstrated that the evaluation of the collateral-flow status before the initiation of intra-arterial treatment could be a key marker to determine a timeframe for reperfusion with a probable favorable clinical outcome. The effect of the quality of collateral flow on clinical outcome has been examined in previous reports, which show that good collateral flow is associated with favorable outcome.5⇓⇓⇓⇓⇓–11 Also, the ORT in intra-arterial treatment was a main determinant factor in predicting favorable outcome.3,4 Regarding collateral flow and ORT as determinant factors of favorable outcome, reperfusion of >300 minutes from onset in a poor collateral group was associated with decreased odds of clinical improvement and favorable outcome from a small retrospective cohort.27 Our study also showed that ORT is a critical determinant of favorable outcome in a time-dependent fashion (each minute, 30 minutes, or reperfusion of >300 minutes were all associated with a decreased chance of favorable outcome). Among the time variables affecting ORT, PRT was the main determinant of favorable outcome in the poor collateral group, which can be a more practical time metric to proceed or not proceed in the consideration of intra-arterial treatment. In the poor collateral group, PRT of >60 minutes was strongly associated with decreased odds of favorable outcome, which can be a practical marker for the determination of endovascular therapy termination. A previous study showed that the procedural time in intra-arterial treatment is a critical determinant of outcomes,28 and further negative impact on favorable outcome was shown in the poor collateral group in our study. The extent of collateral flow has been associated with the rate of hemorrhage in patients with acute stroke undergoing intra-arterial treatment.19,29 In our study, the rate of hemorrhagic infarction was increased in the later time window (eg, ORT of >300 minutes and PRT of >60 minutes), especially in the poor collateral group; this change suggests that the ischemic area in the poor collateral group is more susceptible to reperfusion injury in a time-dependent manner. Unlike that previous study,29 we could not find any significant relationship between collateral-flow grade and parenchymal hematoma. The status of collateral flow at the time of angiography has been shown to be associated with infarct growth in interaction with reperfusion.12 We tried to link the 3-month favorable outcome and diffusion lesion volume to explain the inter-relationship between lesion-volume increments based on collateral-flow status. Perhaps because many cases of unfavorable outcome were excluded in this volumetric analysis, the relationship between ORT and lesion volume was not statistically significant on the basis of collateral-flow grade. However, we found that the chance of increased infarct volume is determined by the PRT and imaging-to-reperfusion time. The main findings of this study were the following: 1) The probability of favorable outcome differed in a time-dependent manner on the basis of collateral-flow adequacy; 2) the rate of hemorrhagic infarction, which is a marker of reperfusion injury, increased with increasing ORT or PRT in the poor collateral group; and 3) lesion-volume enlargement was most prominent in patients with poor collaterals having a longer PRT or imaging-to-reperfusion time. In considering endovascular revascularization as a rescue treatment in patients with acute large-vessel occlusion, the status of baseline collateral flow at the time of angiography can be a crucial marker for favorable outcome and a limiting factor for lesion-volume increments in a time-dependent fashion (Fig 4). Therefore, limiting time-to-reperfusion, especially in patients with poor collaterals, is desirable in clinical practice, though our results should be confirmed in randomized trials or large datasets of prospective trials. 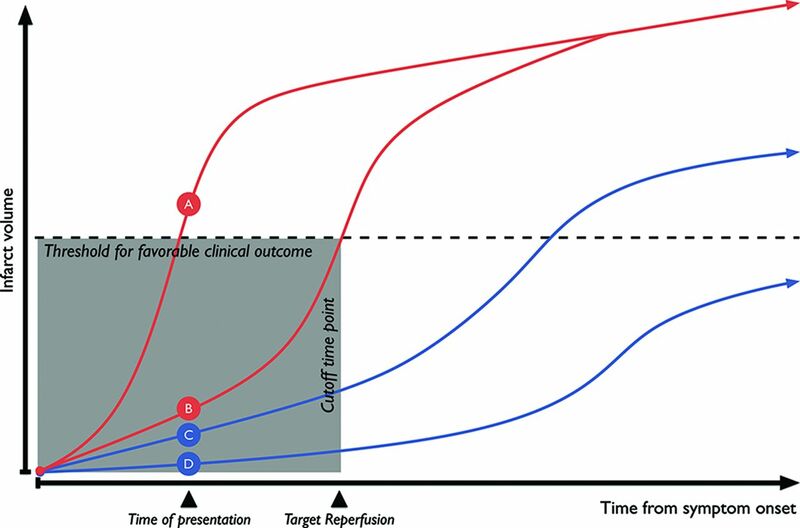 Simplified illustration, which represents the unique effect of time-to-reperfusion on clinical outcome based on proposed collateral scenarios (modified from Liebeskind's illustrations31). A, Universally poor collaterals, which may show large infarcts and severe neurologic deficits at the time of presentation. B, Rapidly failing collaterals, which may show small-to-medium infarcts and severe neurologic deficits at the time of presentation. C, Slowly failing collaterals, which may show small infarcts and moderate-to-severe neurologic deficits at the time of presentation. D, Universally good collaterals, which may show tiny-to-small infarcts and mild-to-moderate neurologic deficits at the time of presentation. In real clinical practice, patients in scenarios B and C can be ideal candidates for endovascular reperfusion. However, the clinical outcome is limited by time-to-reperfusion in scenario B (eg, onset-to-reperfusion within 300 minutes or puncture-to-reperfusion within 60 minutes in this study). The authors thank Wade Martin of Medical Research International for his critical English revision. Y.-H. Hwang and D.-H. Kang contributed equally to this work. Disclosures: David S. Liebeskind—UNRELATED: Consultancy: consultant for the angiography core laboratory at the University of California, Los Angeles*; Grants/Grants Pending: National Institutes of Health–National Institute of Neurological Disorders and Stroke. * *Money paid to the institution. Accepted after revision August 10, 2014.